Get caught up in the Star Wars drama with this authentic Darth Vader helmet and mask set! The licensed accessory is made from injection molded ABS material within in the original studio molds. Plus, the officially licensed masks comes packaged in a display box. 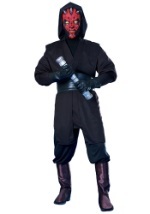 Can be worn with any of our Darth Vader costumes or add to a Star Wars collection!